Kevin Charles King (born May 5, 1995) is an American football cornerback for the Green Bay Packers of the National Football League (NFL). He played college football at Washington, where he was a four-year starter for the team as a safety and a cornerback. He was selected by the Packers in the second round of the 2017 NFL Draft. During his time with Washington, King often played as both a safety and a cornerback where he was a multiple time All-Pac-12 honorable mention his last two years with the team. King was born in Oakland, California and attended Bishop O'Dowd High School. As a child, he played baseball, basketball, and football and originally wanted to play quarterback but at 5'7, could not see over the offensive line. During his time in high school, he was coached by Hardy Nickerson, who played for the Packers in 2002. As a junior in high school, he had experienced a growth spurt and grew to 6'2. He commented that this growth spurt made him stop playing baseball and focus on football, as he was not sure how well he could play shortstop with the few extra inches of height. Prior to his senior year, he was named defensive most valuable player (MVP) at the Oakland Nike Football Training Camp. He finished the season with six interceptions, leading the team. He was named to the first-team All-NorCal and first-team Division three all-state by Maxpreps.com. In addition, he also won accolades in track and field in the 110-meter high hurdles and the 300-meter hurdles. King was highly recruited coming out of high school and was ranked as a three-star prospect by Rivals.com out of a possible five-star ranking, and as the number 73 overall recruit in California. He was recruited by Washington, California, West Virginia, and Arizona State. He stated that winning the MVP at the Nike Football Training Camp brought his "confidence up a bit" and that he now knew he could "play with those top guys." He ultimately committed to play at Washington because he felt that he could come in and play early due to the large amount of junior and senior defensive backs. He chose to major in American ethnic studies and retail management. King played at Washington from 2013 to 2016. During his first year with the team, he played safety (although the team believed him to be more natural at cornerback) and saw snaps during each of the first seven games of the season. He was the first true freshman to start for the Huskies in 2013. He missed several games due to injury, including his first bowl game against BYU. Arguably his best game of the season came against the UCLA Bruins, where he finished with four tackles and a fumble recovery. He continued to play safety his second year on the team and played in 13 games, starting 12 of them at the safety position. The only game he did not start was against Stanford, which he missed due to an illness. King recorded his first career interception in the Apple Cup against rival Washington State, and additionally recorded four tackles. He also forced another fumble, this time against Illinois. During the first bowl game of his college career, he registered nine tackles against Oklahoma State. King continued to play well going into his junior year, as he made the switch to cornerback and recorded three interceptions in the first three games of the year playing in the nickel position. He had a team-high nine tackles (two for loss), a forced fumble, and a recovery against Washington State and finished the year sitting the bowl game out due to injury. His play resulted in him being made an honorable mention on the All-Pac-12 team. Following this season, he considered coming out of school and declaring for the NFL draft but Huskies' co-defensive coordinator Jimmy Lake encouraged him to return for his senior year to build up more film as an outside corner which he believed was the most likely position he would play in the NFL. As a senior, King started every game of the season at cornerback and finished the year with two interceptions, 44 tackles, and 3.5 for a loss. His efforts earned him a second All-Pac-12 honorable mention and an honorable mention on the Academic All-Pac-12 Team. One of his interceptions came against Arizona State in which he caught a one-handed interception on a fade pass from Manny Wilkins in a game that they ended up winning 44–18. King attended the NFL Scouting Combine and completed all of the combine drills. He ran the fastest three-cone drill and short shuttle of all defensive backs and tied for 11th among all defensive backs in the 40-yard dash. At the conclusion of the pre-draft process, King was projected to be a first or second round pick by NFL draft experts and scouts. He was ranked the third best cornerback prospect in the draft by NFLDraftScout.com, was ranked the fifth best cornerback by ESPN, was ranked the seventh best by Sports Illustrated, and was ranked as the fifth best cornerback, along with Tre'Davious White, by NFL analyst Mike Mayock. The Green Bay Packers selected King in the second round (33rd overall) of the 2017 NFL Draft. King was the sixth cornerback drafted in 2017. Packers director of football operations Eliot Wolf commented that he was excited to add someone with King's size to the team and that he was expected to come in and compete for a starting job right away. On May 11, 2017, the Green Bay Packers signed King to a four-year, $7.08 million contract that includes $4.67 million guaranteed and a signing bonus of $3.28 million. King was not able to attend organized team activities due to the leagues policy on colleges that followed the quarters system. Rookies are not able to join their team until their college has concluded their final semester. During that time frame, he worked heavily with cornerbacks coach Joe Whitt to get up to speed on the playbook over the phone and via Skype. Throughout training camp, King competed to a starting cornerback against Damarious Randall, Davon House, Quinten Rollins, and LaDarius Gunter. Head coach Mike McCarthy named King the fourth backup cornerback on the depth chart to start the regular season, behind Davon House, Damarious Randall, and Quinten Rollins. He made his professional regular season debut in the Green Bay Packers’ season-opening 17–9 victory against the Seattle Seahawks. On September 24, 2017, King earned his first career start after Davon House was sidelined due to a quadriceps injury. King finished the Packers’ 27–24 win against the Cincinnati Bengals with a season-high seven combined tackles (five solo). King was inactive for the Packers’ Week 6 loss at the Minnesota Vikings after suffering a concussion the previous game. He was sidelined for a Week 11 loss to the Baltimore Ravens due to a shoulder injury. He was also sidelined for a Week 11 win against the Tampa Bay Buccaneers after aggravating his shoulder injury. On December 6, 2017, the Green Bay Packers officially placed King on injured reserve due a lingering shoulder injury. King spent the majority of the season dealing with a shoulder injury that at times prevented him from lifting his arm above his head and that dislocated multiple times during the season. The following week, King underwent surgery by Dr. James Andrews to repair a torn labrum in his left shoulder. King finished his rookie season in 2017 with 28 combined tackles (22 solo) and five pass deflections in nine games and five starts. King rehabbed throughout the offseason and returned in time to participate in organized team activities. During training camp, King competed for a job as a starting cornerback against Davon House, Tramon Williams, Jaire Alexander, and Josh Jackson. Head coach Mike McCarthy named King and Tramon Williams the starting cornerbacks to start the regular season. King was inactive for two games (Weeks 3–4) due to a groin injury. On October 15, 2018, King made four solo tackles, broke up a pass, and made his first career interception during a 33–30 victory against the San Francisco 49ers in Week 6. King intercepted a pass by 49ers’ quarterback C. J. Beathard, that was originally intended for wide receiver Marquise Goodwin during the fourth quarter to seal the Packers’ victory. He suffered a hamstring injury in Week 9 and missed the next four games before being placed on injured reserve on December 5, 2018. ^ a b c d "Green Bay Packers: Kevin King". Packers.com. January 23, 2018. Archived from the original on October 2, 2017. Retrieved January 23, 2018. ^ a b c d e f Schnell, Lindsay (April 21, 2017). "How Kevin King, the hidden gem of an NFL-bound secondary, became a draft late riser". Sports Illustrated. Archived from the original on January 26, 2018. Retrieved January 25, 2018. ^ "Kevin King". Archived from the original on February 11, 2018. Retrieved January 24, 2018. ^ a b Durkin, Jimmy (August 20, 2012). "Bishop O'Dowd High football player Kevin King commits to Washington". Bay Area News Group. Archived from the original on March 8, 2017. Retrieved January 24, 2012. ^ a b c d e "Kevin King". Archived from the original on August 6, 2017. Retrieved January 24, 2018. ^ Caple, Christian (September 22, 2015). "Huskies' Kevin King has 3 interceptions in 3 games – all as a nickel back". TheNewsTribune.com. Archived from the original on June 12, 2017. Retrieved January 24, 2018. ^ Chiu, Jeff (December 1, 2015). "Pac-12 football all-Conference team announced". Pac-12 News. Archived from the original on December 2, 2015. Retrieved January 24, 2018. ^ "Pac-12 Football Awards And All-Conference Team Announced". Pac-12 Conference. November 29, 2016. Archived from the original on November 1, 2017. Retrieved January 24, 2018. ^ "Pac-12 Announces Football All-Academic Teams". Pac-12 Conference. November 30, 2016. Archived from the original on January 25, 2018. Retrieved January 24, 2018. ^ Wilde, Jason (May 9, 2017). "Packers: Top draft pick Kevin King intent about 'making plays'". Wisconsin State Journal. Archived from the original on January 27, 2018. Retrieved January 26, 2018. ^ Zierlein, Lance. "Kevin King Draft Profile". NFL.com. Archived from the original on May 6, 2017. Retrieved January 25, 2018. ^ Burke, Chris (April 24, 2017). "2017 NFL draft rankings: Top prospects by position". SI.com. Archived from the original on April 8, 2017. Retrieved May 15, 2017. ^ Legwold, Jeff (April 22, 2017). "Ranking 2017's draft top 100 players". ESPN.com. Archived from the original on April 28, 2017. Retrieved May 15, 2017. ^ Mike Mayock (April 12, 2017). "Mike Mayock's 2017 NFL Draft position rankings 4.0". NFL.com. Retrieved November 3, 2018. ^ "2017 NFL draft: Green Bay Packers picks". PackersNews.com. April 30, 2017. Archived from the original on April 21, 2018. Retrieved April 21, 2018. ^ "Packers take cornerback with first pick". Packers.com. April 28, 2017. Archived from the original on April 29, 2017. ^ McGinn, Bob (April 27, 2017). "Packers trade first-round pick to Browns". Milwaukee Journal Sentinel. Archived from the original on January 27, 2018. Retrieved January 26, 2017. ^ Hodkiewicz, Wes (April 28, 2017). "Waiting extra day worked out for Kevin King". Packers.com. Archived from the original on January 27, 2018. Retrieved January 26, 2018. ^ "Spotrac.com: Kevin King contract". Spotrac.com. Retrieved November 3, 2018. ^ Huber, Bill (June 13, 2017). "King Finally Allowed to Practice". Scout.com. Retrieved January 26, 2017. ^ "Green Bay Packers: Quinten Rollins determined to be part of revamped secondary". lacrossetribune.com. June 9, 2017. Retrieved November 3, 2018. ^ "Packers projected depth chart following 2017 final cuts". acmepackingcompany.com. September 4, 2017. Retrieved November 3, 2018. ^ "Packers Injury Report, Week 5: Davon House & Nick Perry practiced fully on Thursday". acmepackingcompany.com. October 5, 2017. Retrieved November 3, 2018. ^ "Packers vs. Vikings inactives: David Bakhtiari returns, Kevin King out". acmepackingcompany.com. October 15, 2017. Retrieved November 3, 2018. ^ "Packers inactives: Rookie CB Kevin King inactive vs. Ravens". packerswire.usatoday.com. November 19, 2017. Retrieved November 3, 2018. ^ Demovsky, Rob (December 6, 2017). "Packers rookie CB Kevin King done for season". ESPN. Archived from the original on December 7, 2017. Retrieved January 26, 2017. ^ Hodkiewicz, Wes (December 7, 2017). "McCarthy: CB Kevin King will undergo shoulder surgery". Packers.com. Archived from the original on January 27, 2018. Retrieved January 26, 2018. 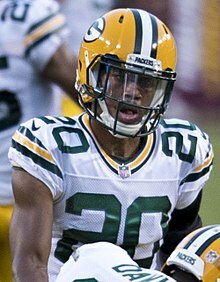 ^ "NFL Player stats: Kevin King (career)". NFL.com. Retrieved November 3, 2018. ^ Wood, Ryan (May 22, 2018). "Packers CB Kevin King 'sticking to plan' in recovery from shoulder surgery". PackersNews.com. Retrieved November 3, 2018. ^ Kruse, Zach (August 22, 2018). "Packers deciding between 5 CBs for 3 starting spots". packerswire.usatoday.com. Retrieved November 3, 2018. ^ "Ourlads.com: Green Bay Packers Depth Chart: 09/01/2018". Ourlads.com. Retrieved November 3, 2018. ^ "Kevin King's Lack Of Availability A Pain For Packers". Forbes.com. September 21, 2018. Retrieved November 3, 2018. ^ "San Francisco 49ers at Green Bay Packers – October 15th, 2018". pro-football-reference.com. Retrieved November 3, 2018. ^ "Packers claim two defensive players off waivers; place King, Carson on injured reserve". Packers.com. December 5, 2018. This page was last edited on 15 April 2019, at 17:49 (UTC).